Yes, it's always been default. Someone already mentioned here that both searches used to be the same. Now they sometimes differ. How can my Pseudo summary report total views of 4 images when I myself have 5 and there's a total of 61 on Alamy? Which is truly inexplicable. Relevant should be the default. The number of views only relates to images on the pages which were actually looked at. The search may have returned 20 pages worth of images, but if the searcher only looks at the first two pages, only those images in those pages get recorded as views. Your four images were in those first few pages, the rest did not get looked at. Anyway lets hope things will improve next week! I've received an answer at 16:51. Only about today's hickup btw because that's what I did report about. My guess is that I can freely share this. We were experiencing some temporary issues earlier today which could have affected the load times of results, but our tech team have confirmed that this has been rectified and everything should be running as normal. The issue does seem to be cleared now, but I had the non-loading pics issue several times over the last week or more. Customer activity and sales have crashed everywhere as far as I've seen. I believe its because free is now the new normal thanks to sites like Unsplash and Pexels. They manipulate tons of photographers who are desperate for attention to give their work away for free so they can get massive site traffic and smother out the whole online stock industry. Now consumers expect images for free and stock photos have little to no value. I think thats why prices are dropping on all sites so much, as they are trying to compete with free to stay alive. While these sites dont cover unique editorial content like Alamy has, it still affects the consumers impression of the value of a stock photo regardless. There used to be a huge shift from macro to micro... now its moving to free. Thats where the fish are going. While these free photographers argue that its just a hobby for them and they want to feel good about themselves giving their work away for nothing, it lays waste to everyone else. You invest in your future by adding value to your product, not subtracting. Its tough to have a future in something that now operates at a loss. This is a separate, possibly valid issue, but it's not the one under discussion here. The growth of sites giving away free images does not induce a cliff-edge fall in views of the magnitude experienced at Alamy in recent days. Such a massive, sudden change can only be a systems related internal issue. Absolutely depressing. These idiots who are givng their work away, what do they gain ? The millennials seem to think everything should be served free on a plate, including music which I also sell. If you look at one page, that would normally report as 100 unless there are less than one hundred images on Alamy. So the report should have said 61 as there were 61 images on Alamy and all would have been seen on that one page. (OK so far?) "Total views" reports only 4 images meaning, I assume, that there should only be a total of 4 images of that subject on Alamy. However there are in fact 61, all of which should have been seen on one page including all five of mine not 4, or have I been misunderstanding the figures all this time? It is possible to set the number of search returns to 30, 60 ,100 or 120 per page. Although 100 is the default perhaps the picture researcher happened to select 30 in your case. Same here with music. Almost no album sales yet piracy like crazy. Be it music, photos, movies... people honestly believe it should all be free with no regard for the creators and work to create it. Actually had multiple coworkers at work today ranting together about how copyrights are stupid and everything should be free for them. Like a fountain of infinite appeasement. You simply cannot tell them otherwise. Those photographers giving their photos away for free feeds that attitude in exchange for feeling important about themselves. At least until they realize others are making money off of their work they gave away for nothing. It is a difficult one and my views are no popular but the way I see it, especially with music/film, is that the century we had of copyright and recorded images was actually an unnatural blip - although to us living in the period it does, of course, seem to be totally natural. Before the means to record music/images there was no real way for creators to stop people "stealing" their creations and all monies came from live actual performances. Shakespeare might have written the play but there was nothing he could do to prevent someone in the audience noting it down and taking it back to their own group of players and copying it - songs written by a composer would be listened to and repeated by other musicians. The players got paid for performing the work not conceiving of it - and of course, there was very little chance they would know who had copied their work - how was Mozart going to know that a group of bagpipe players was attempting his Magic Flute unless he was in the place they were doing it (of course for them to do it at least one of them would have had to pay to see its performance beforehand). Of course, orchestras paid composers and theatre groups paid writers but the writers/composers if they thought about exclusivity at all they understood there was no way to enforce. The idea that every person using their work would pay for it was unnatural to them because it wasn't possible. I think the internet is just causing a return to that situation - musicians especially will have to make their money through the performance of work not the creation of work alone. Possible, but more likely is the use of filters by the client. There are a couple we don't see* in our report. Then there's territory: not all results are visible in all territories. E.g. one big German agency has a restriction on Europe: we don't see any of the results that are very regularly reported in the Images found thread. And then there's the images underneath a zoomed image: do we know if and or how they're counted? Are they counted/visible as zoomed images? Views? The filters were the only thing I could think of. Of course it was the image best suited to the search term that failed to be viewed. Typical. Oh? I always thought [RM] meant the client had filtered on RM and [MR] meant they were looking for a model released image. 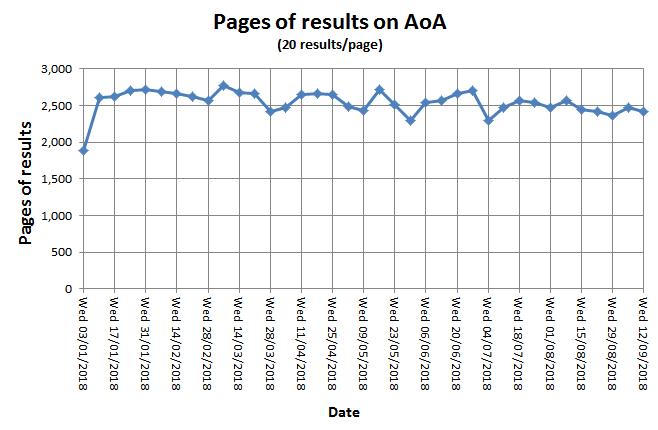 Concerned by reports of plummeting views from individual contributors I did some analysis of the number of pages of search results on AoA which should give a more statistically significant viewpoint. The graph below shows the number of pages of search results during the 5 days of each week since the start of this year (NB. I've added 25% to the most recent week as Friday's data isn't available yet). This should give an indication of the level of the recorded activity from registered Alamy customers. As you can see there's no sudden drop in recent weeks. There is however some evidence of a slow decrease which could be a concern given that the number of images in Alamy's collection has increased over the period, (although search activity from registered customers is not the same as sales activity or revenue). I'm also not sure whether activity from all Alamy's distributors' websites is captured in AoA or not. Apparently, CTR can mysteriously go back up on its own. I averaged 0.63 (according to CTR graph data) for the first seven months of 2018. My CTR then dropped inexplicably to 0.38 in August. Sales and zooms took dives as well. Without my doing anything, my CTR is now back up to 0.63 (exactly) and sales numbers and zooms seem to be heading north again.